"The lady standing with travel bag. 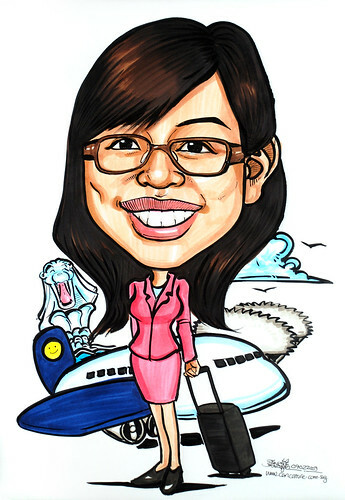 The background would be Esplanade and Merlion"
The client initially wanted Q-digital caricature of this Air Steward and Stewardess (by Artist Q). Given that the body and setting is a template, nothing can be changed, and he needs Esplanade and Merlion, he can only opt for the fully customised drawing - caricature with theme in colour drawn by me. Everything was drawn from scratch, according to what the client wanted.